Get our new 2019 pricing guide! All our prices in one convenient place! HEPACART® certifies each filtration unit specifically for HEPA air quality and air flow to ensure superior safety. With rugged aluminum construction, our products will provide you a virtual lifetime of use. Using HEPACART® products reduces waste associated with disposable tents and other temporary enclosures. HEPACART® products are designed for portability, efficiency, and effectiveness in many environments. Over 50+ retrofit options make HEPACART® a dynamic product that can evolve from one project to the next. HEPACART® products mean you are serious about infection and dust control. 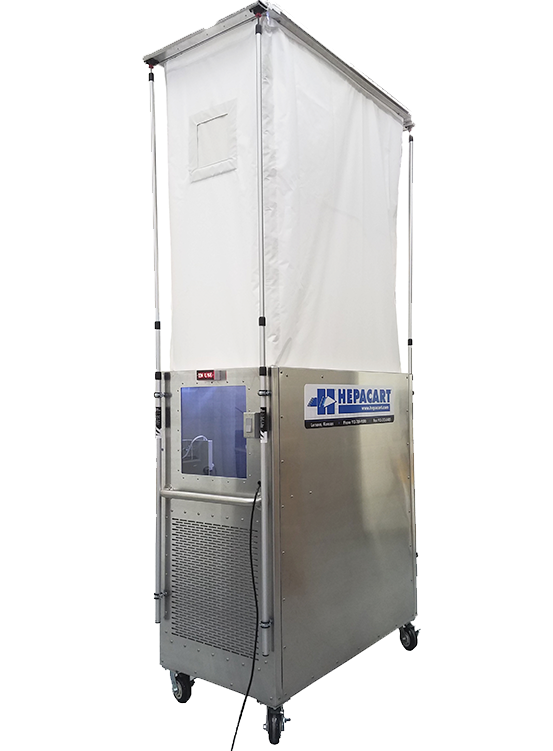 Every HEPACART model features HEPA-rated filtration that helps to keep patients and staff safe from airborne dust and pathogens. And we've designed each model around feedback that comes directly from our customers who are working in healthcare facilities every day. With the push of a button, you can raise and lower the height of this HEPACART to suit your needs, up to 10' 6". Every patient care facility and hospital must be mindful of Infection Control. HEPACART® offers a range of products that can keep renovation, construction, and maintenance areas contained in a way that protects patients and does not hinder staff's ability to provide care. Virtually any construction project can create dust and debris. In delicate environments, this is a major problem. 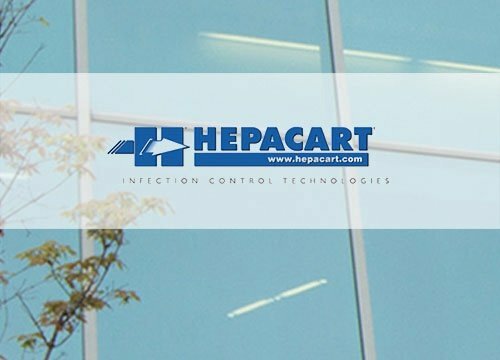 The HEPACART® line of products can create negative air pressure that captures and filters dust and contaminants so that they are never released into the rest of the building. Each HEPACART® product is designed to make remodeling, renovation, maintenance, and construction easy and safe. With HEPACART®, anyone can easily ensure a clean environment stays that way. Our products are easily affordable, durable, and portable for maximum efficiency. See how easy and efficient it is to install a HEPACART® Anteroom at your facility. In a matter of minutes, you can have total room isolation. STARC® Systems modular containment systems, available through HEPACART®, are a simple, easy to use, and environmentally friendly alternative. Our Negative Air Machine is inspected and certified to clean the air to Level 5, 99.99% with a MERV rating of 18. Every HEPACART receives HEPA filter integrity tests (IEST-RP-CC0034.2) as well as particulate tests for ISO 14644 Class V air. Certification paperwork is included in each purchase and valid for one year. Now available in our best selling Classic Models (with telescoping poles) or the newest Auto-Lift Models (with push button automation). Embedded, lab tested HEPA filtration system with each unit tested and certified prior to shipping. 15 work efficiency options included including the HALO LED light package. Sets up and moves in less than 90 seconds. Enclosure is antimicrobial, anti-static, fire resistant and easy to clean. Super durable and healthcare facility approved. Heavy duty framed base with each caster rated for 900 lbs. Our original HEPACART® models form 2007 are still utilized today. 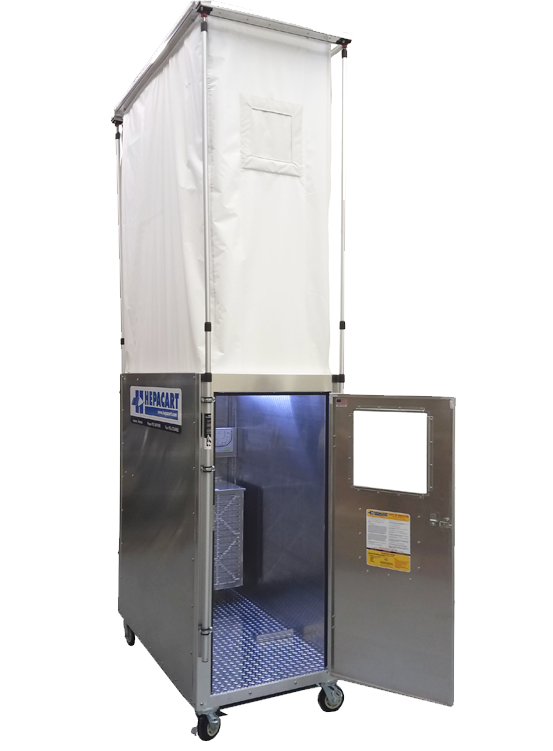 The HEPACART® Environment Ceiling Access Containment Cart is engineered and constructed by healthcare contractors for healthcare contractors. 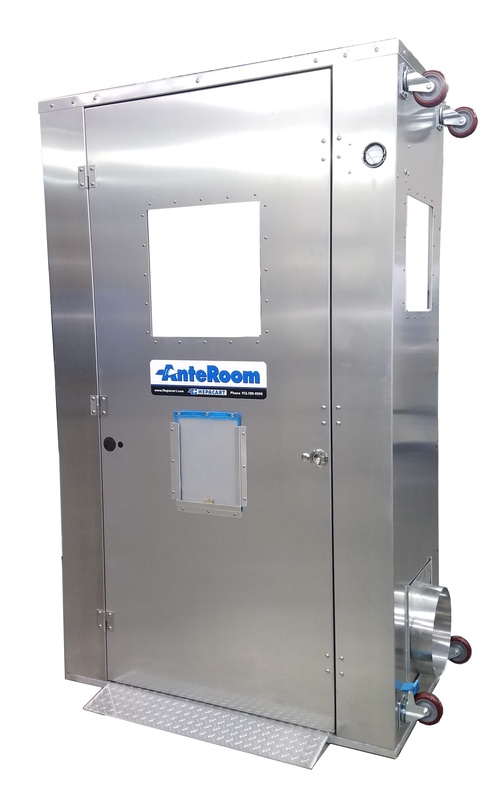 It was designed to make dust containment and infection control in high-risk environments easier to handle without compromising on essential safety protocols. Stocked and available through HEPACART®, STARC® Systems is a simple, easy to use, and environmentally friendly alternative to other temporary dust containment options. Reduces sound transmissions providing 25 decibel sound reduction. Installs quickly. With experience you can assemble nearly 100 linear feet in an hour. 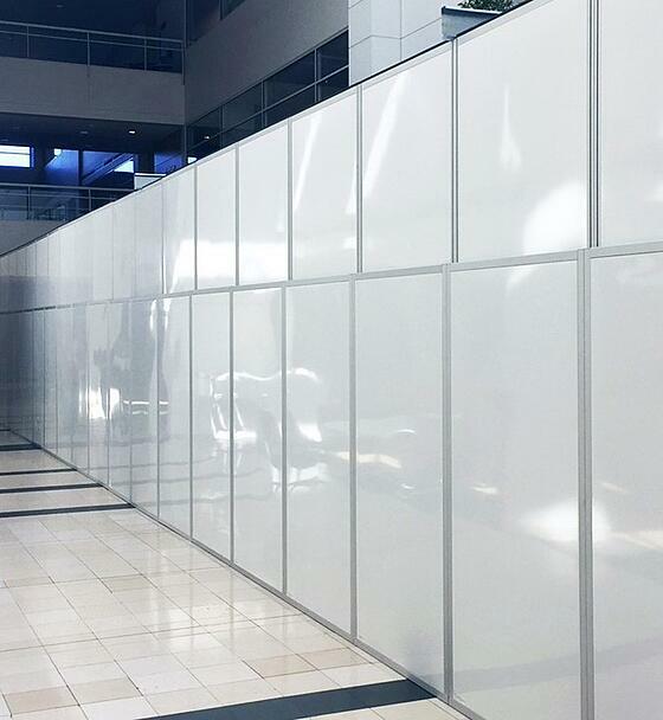 Features telescoping wall panels that are highly customized to any environment. Available through HEPACART®, are a simple, easy to use, and environmentally friendly alternative to other temporary dust containment options. 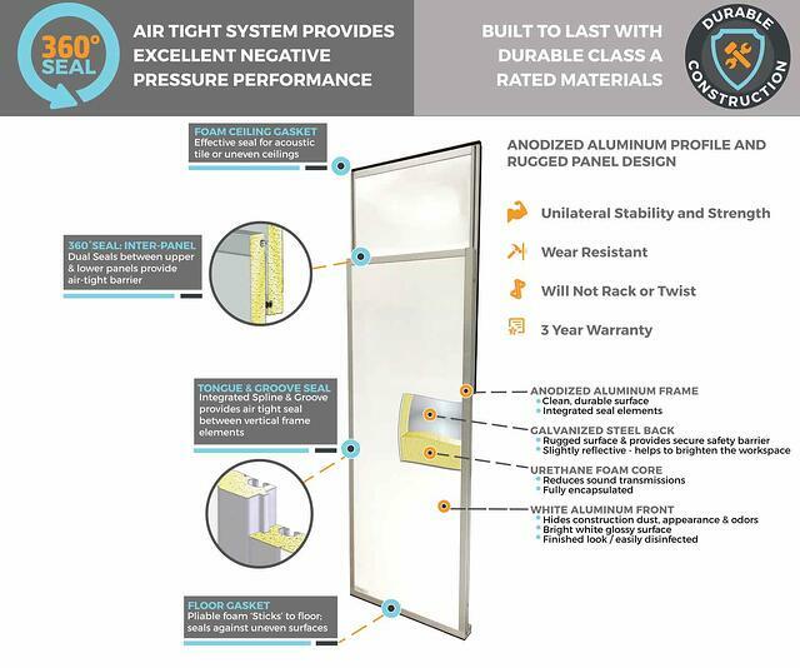 The airtight walls can be configured in virtually any shape while the telescoping design ensures an airtight seal, no matter what the shape or size of the contained space. The award winning HEPACART® AnteRoom is an temporary room isolation module that serves as an entryway or vestibule into any larger room undergoing maintenance, renovation or construction. It installs in less than five minutes and pays for itself after just one project. Award winning product for sustainability and innovation. Customized with extenders, reducers or expanders to fit any size door from 28" to 52" or add depth in 1 ft. and 2 ft. increments. Meets requirements for Class IV Infection Control measures when paired with a HEPA-filtration and a negative air machine. Includes LED lighting, magnahelic and other work efficiency options. The HEPACART® AnteRoom is an external aluminum passageway that serves as an entryway into any larger room undergoing maintenance, renovation or construction. 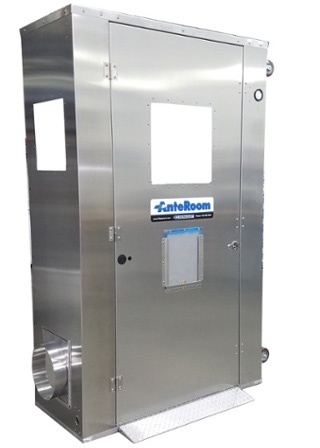 The HEPACART® AnteRoom provides total room isolation, a containment measure that mitigates patient risk from work dust and related contaminants. The AnteRoom comes in two models. A productivity tool that allows contractors and facility workers to feed cable quickly in through lift-out ceiling tiles. Works in a 2'x2' ceiling grid or a 2'x4' ceiling grid where cable can be fed quickly and cleanly through a protected opening. 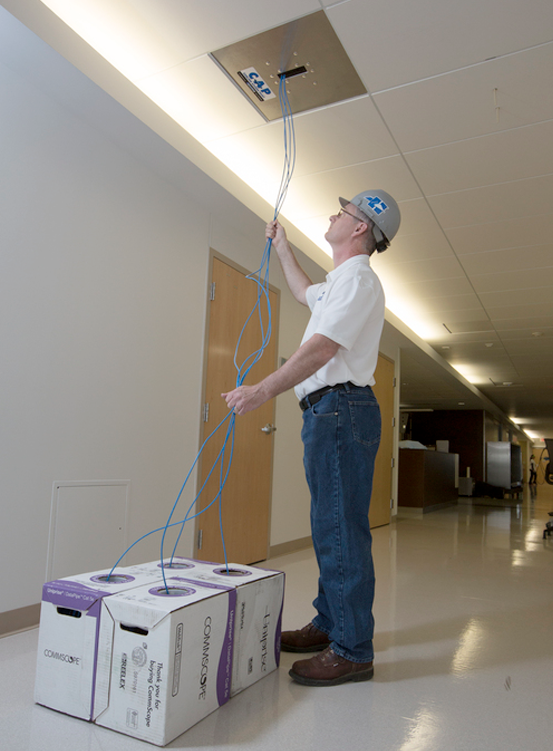 HEPACART® CAP is a productivity tool that saves time and money when pulling cable in a lift-out ceiling. The HEPACART® CAP user will spend less time pulling cable and be confident that it is free from nicks or scrapes. HEPACART® provides an access point in the ceiling to assist installers in quickly pulling cable through the slot and between the rollers. But what about the particles that are still too small to be caught by a HEPA filter, like influenza and tuberculosis? 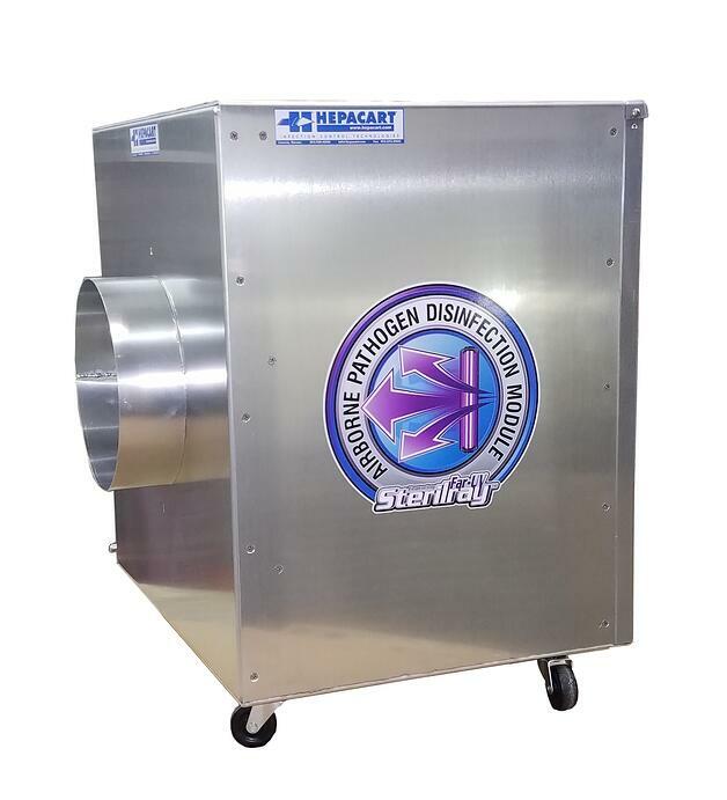 Our sustainable, USA-made Airborne Pathogen Disinfection Module can destroy the airborne pathogens such as bacteria, mold, and viruses like tuberculosis, measles and influenza that do not get caught by HEPA filtration in just one pass. By utilizing Far-UV Sterilray™ technology, the module physically destroys pathogens before they are ever expelled from your HEPA filtration unit. 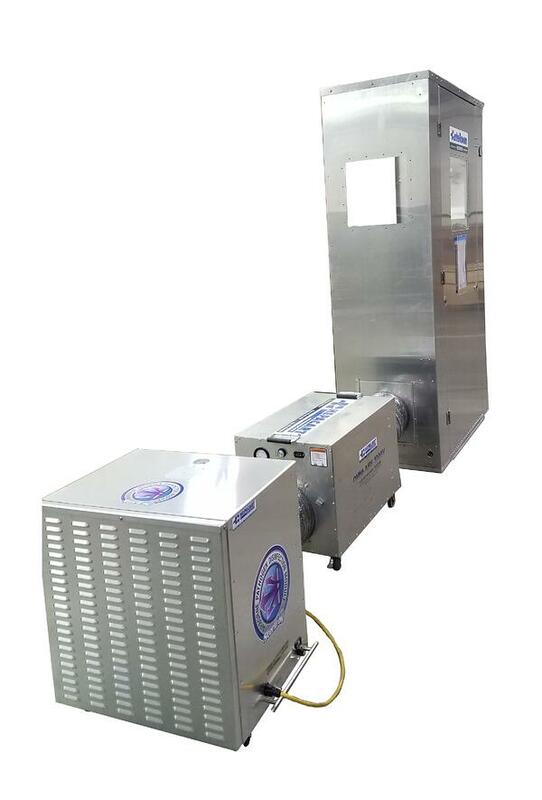 The Airborne Pathogen Disinfection Module with Far-UV Sterilray™ show here providing secondary Far-UV disinfection with an Anteroom and negative air machine setup. As the makers of HEPACART®, we are proud to manufacture the DUSTBUGGY®! 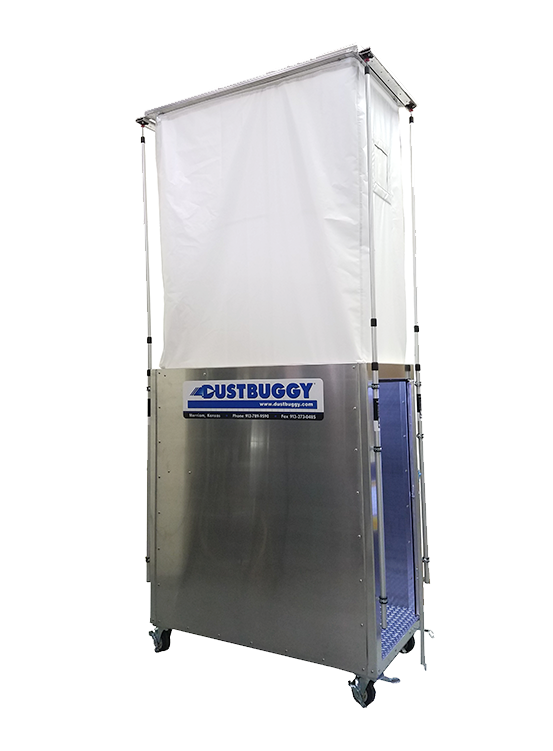 The DUSTBUGGY® is a mobile dust containment cart without a negative air machine or HEPA filtration embedded in the unit. If you need to have the high safety standards of HEPACART®, but you don’t anticipate using the Negative Air Machine built into HEPACART®, the DUSTBUGGY® is a great solution. Heavy duty framed base with eachcaster rated for 900 lbs.